Join us for an opening reception at the Offsite Gallery, 1st Floor, World Trade Center, Norfolk, VA 23510. Free & open to the public. 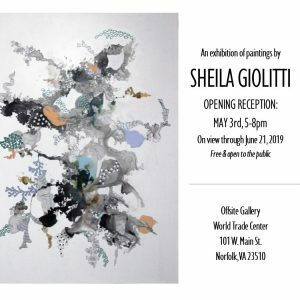 Sheila Giolitti’s paintings are meditations on the interconnectedness of matter and thought as an ongoing process. A continuing dialog often ties recent work to artwork previously created. Paint appears both fluid and strict, self organizing and ever evolving. The tension and intricacies of her work speak to the complexity of the evolutionary process. Viewers are encouraged to probe for meaning; creating their own narrative within an abstract landscape. Exhibition on view through June 21, 2019. Gallery hrs: Monday-Saturday, 8:30am-5:30pm, Sundays see security for entry.